"La Saetta Iridiscente", or "The Iridiscent Lightning Bolt", created by Giulio Candussio and students of the Scuola Mosaicisti del Friuli, in Spilimbergo (Venice), and presented as a gift to the government of the USA in 2003. Maestro della luce e della forma, master of light and form. Giulio Candussio, sculptor, photographer, digital artist and mosaic expert is widely known for his numerous sculptures and masterworks in the field of mosaics. He studied at the Scuola Mosaicisti del Friuli Spilimbergo in Italy where he has been the Artistic Director and long-time teacher of mosaics and mosaic desing since 1994. Together with a number of his most talented pupils he created "La Saetta Iridiscente", or "The Iridescent Lightning Bolt", a piece of art that was a gift of the Region of Friuli-Venezia-Giulia in Italy to the City of New York. The 37 meter long, 4 meter high artwork now hangs on the wall of the Path Ground Zero subway station, under the World Trade Center in Lower Manhattan. The station, designed by the famous Spanish architect Santiago Calatrava, was completely destroyed during the terrorist attacks of September 11th, 2001. After several re-buildings, a new entrance to the temporay station was opned in 2008, a place where some 4,5 million people pass through every day. "A positive energy is unleashed and binds two peoples in a shared desire to overcome moment of horror, to move forward, and to build a peaceful future." Giulio Candusso explains: "The Iridiscent Lightning Bolt is an artwork that unites two peoples who have both been affected by a disaster. In 1976 the region of Friuli-Venezia-Giulia was hit by an earthquake and a number of villages were completely destroyed. At that time, the Americans supported the Italian victims and supported the reconstruction of the affected area. America was in turn affected by the airplane attacks on the Twin Towers of the World Trade Center in 2001. So two peoples have both suffered a terrible tragedy. Through "The Iridescent Lightning Bolt", which represents a release of energy, the Friuli-Venezia-Giulia region wanted the thanmk the American people for their support at that time and to show solidarity with the helplessness and sadness felt following the attacks of September 11th. We also wanted to remember the victims of 2001." "A symbol of energy and rebirth"
Candussio got the idea for the "Iridescent Lightning Bolt" after a visit to the Sistine Capel in Rome, in the Apostolic Palace, the offical residence of the Pope in the Vatican City. Candussio: "I had visited the Sistine Chapel during some restoration work. I also climbed the scaffolding then. I studied the Sistine Chapel ceiling that was painted by Michelangelo between 1508 and 1512. When I looked at the ceiling decoration, I particularly studied 'The Creation of Adam', where God stretches out his finger to give live to Adam. It made me think of a sudden discharge of energy passing form one hand to another, positive energy being transmitted from one population to another. That to me was the source of inspiration to create the "Iridescent Lightning Bolt'. It is a symbol of energy and rebirth. 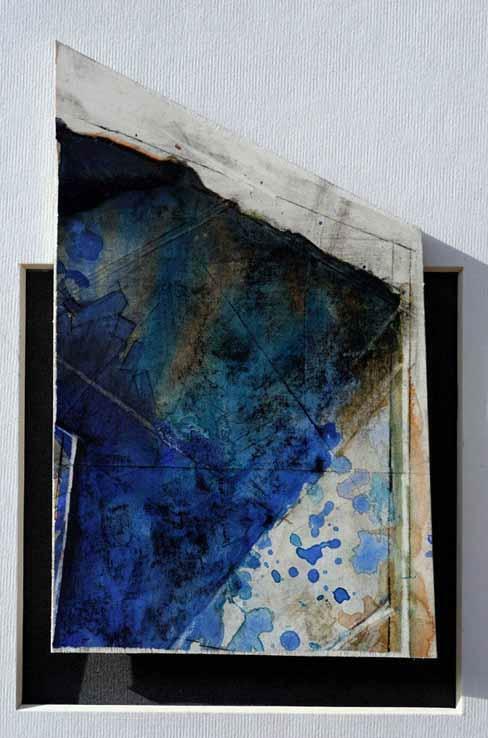 An innovative, three-dimensional artwork with a relief in relation to the wall. A work of art that casts the light in a certain way. Everything has been made using a computer. The support structure has been made using modern technology and the whole thing is made of stainless steel and cut with a laser. The artwork itself is made enrtirely of Venetian glass, smalti Veneziani. The mosaic has not been laid directly onto the wall, but placed in a series of steel boxes especially made by expert craftsmen." "I wanted to discover the spirit of mosaics." Giulio Candussio was born in the Carnia region of Italy in1945, some 2 kilometres from the Austrian border. When he was 6, he moved with his parents to the village of Palmanova, near to Aquileia. It was in Aquileia where, as a young boy of 10, he fell in love with the art of making mosaics. Candussio enthuses: "My love affair with mosacis started as a natural consequence of my perseverance. When I was younger I always went to see the mosaics in Aquileia. Aquileia is an old Roman city in the province of Udine, some 10 kilometres from the Adriatic Sea. Today the city is small, but in the Antiquity it was large and prominent and one of the world's largest cities. At the time it was described as 'The Second Rome'." The beautiful Basilica di Aquileia contains a fourth-century mosaic floor. Candussio: "I took everry chance to go and see the mosaic workers of Aquileia. I was fascinated because the mosaic satisfies both aesthetic and practical requirements. For me, mosaics are a connection between beauty and functionality. I went there repeatedly because I wanted to look behind the art. I wanted to know what really lay behind the surface of the mosaic. I wanted to understand it. I wanted to discover the spirit of mosasics." Candussio plays with light and form better than anyone else which enables his artworks to achieve the optimum expression. "The urge to explore is in my blood, in my chromosomes. I'm curious and was born with a desire to know more and more. If I discover something, I am still not satisfied and want to know more. I always want to discover new things. You want to find something that opens your mind because you discover that you actually know nothing. There is so much to learn, to be someone, you really have to get inside things. I wanted to understand the expressive language of mosaics. It is like a painting or a sculpture that expresses itself in its own way. Just like other arts, mosaics have a system of communication, of talking using a very precise language." "I believe that the mosaic has unconsciously penetrated my soul." Giulio Candussio comes from a village in Carnia where there was an artisanal atmosphere. His ancestors, by both necessity and tradition, were woodcutters, shepherd, farmers, masons, iron workers and house builders. They also hunted wolves. 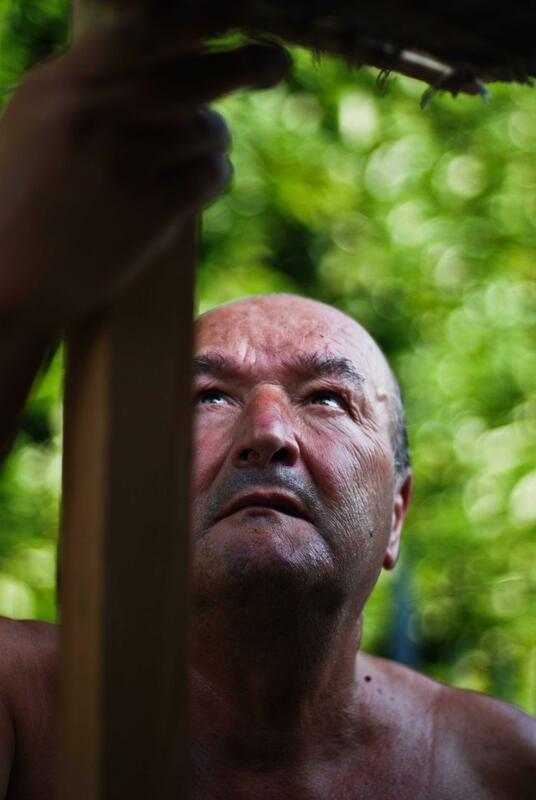 Candussio's father also built houses and managed to bring over tp Giulio his love for the forest, the trees, and wood as a material. It all began there in the mountains and forests of Carnia. Giulo remembers: "The first signs of my career presented themselves in the form of a box of colored pencils and a notepad with lines in it my mother put into my hands one quiet winter's day. It was in 1957, aged 12, that he came into contact with Spilimbergo thanks to his mother. His mother had made an appointment with the director of the Scuola Mosaicisti di Spilimbergo. But his mother had seen her son's thought much earlier when he was studying the mosaics of the Basilica di Aquileia. "I believe that the mosaics subconsciously penetrated into my soul through my eyes. After that, over time and through the constant oberservation of these magical surfaces,. radiant with light and color, together with my own intuition, I learnt the big 'Lesson of Aquileia'. That lesson was the starting point for my visual revolution, projected on exploring a new world in which I could express myself. Matters always appears in the same way to the eyes of those that see it, but only through the eyes that actually view it can it penetrate into the souils of things. I originally chose mosaics as a living simply to live, because it was difficult to l;ive from art in Spilimbergo. So I saw it as a profession and went to work for some large companies. I also did a lot of research and from 1984 to 1986 developed some special prrograms together with some experts in the field of computer science." Today Candussio is considered as oe of the pioneers in the field of multi-media technologies, especially in their use with mosaics. Giulio Candussio has developed a practice based on individual perception, experimentation and research across various art forms. 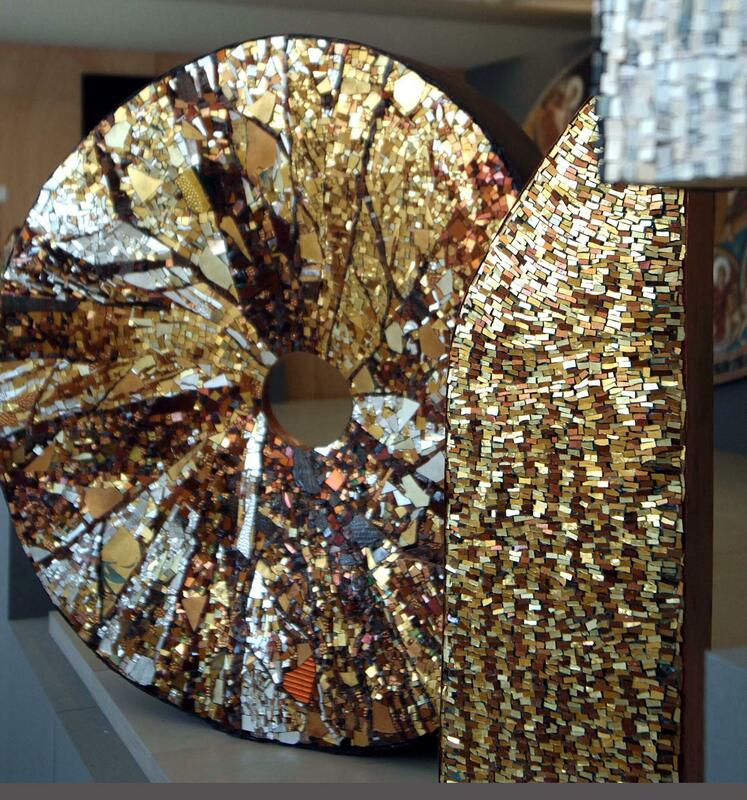 In 1979, Candussio, mainly known as a mosaic artist, exhibited in the Istituto Italiano Stuttgart. In 1980, he became the Art Director of Bisazza, driving creative research in the field of mosaic. Candussio worked for Bisazza from 1980 to 2001,around 20 years. Candussio appeared refreshed in his function and with his experimentation and research gave Bisazza a new direction by engaging in mosaic-interpretations of sketches by contenporary artists such as Hoffman, Hopkins, Tadini and Sabonet. In 1996 he became Artistic Director of the School of Mosaicists in Spilimbergo. 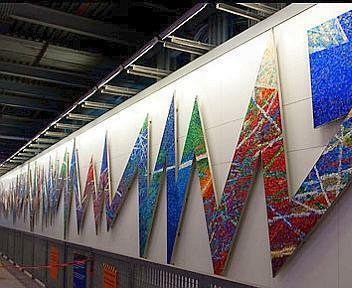 Among his mosaic projects are the Tottenham Court Road tube station in London (1983), devised by Eduart Paolozzi, and the "The Iridescent Lightning Bolt". In 2002, Candussio created a large-scale art work in the Centro Ricerche Fiat a Torino in the context of an Art-Park He created a beautiful, circular sculpture (see photo on the left). In front of the laboratory of the headquarters of FIAT in Turin. He also created the 'Liberty' collection of hand-cut glass tiles for Trend UA, a modern take on the mosaics such as those created thousands of years ago by the Greeks and the Romans and the covering of the pavillions in the branch of Bisazza in Spilimbergo when he enlarged a painting by Piero Dorazio (1989) to a size of tens of meters. 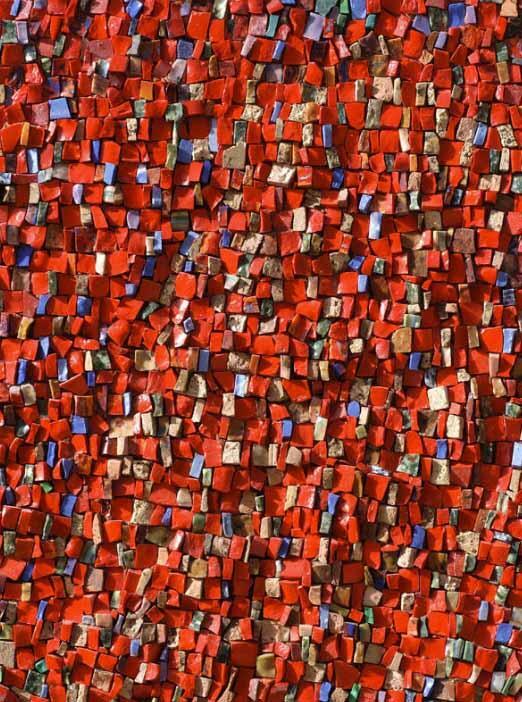 In 2001, he took part in the Moscow Biennale of Contemporary Art. In recent years he has served as Artistic Director of Trend S.P.A. and also worked in Vicenza where he has given some international master's programs. Candussio hopes to publish a book shortly, "La Forma e La Pelle, with an accompanying CD, in which he sets out his vision on mosaics. Candussio: "Everyone treats mosaics as a form of ancient art, but nobody talks about the contemporary possibilities. The aim of my book is to allow people such as the architects and teachers of the Architecture Faculty to see what modern mosaics can mean and what all the possibilities are. 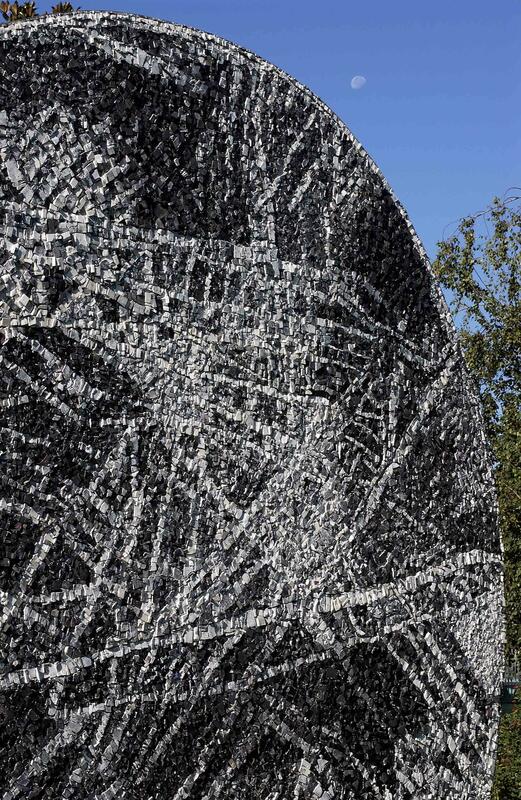 "La Pelle" is the mosaic and "La Forma" represents the structure, the body. Candussio: "Light is one of the important factors in mosaic. It is actually the guiding principle of the mosaic, that is to say the mosaic originates out of the light. Try to imagine what the ratio was of light to the Byzantine mosaics. Byzantine mosaics are on walls because at the time of the advent of Christianity there were no books. There was no way to communicate the history of your faith to the people. If you go into a church of that time today, you can see the beautiful golden mosaics that reflect the light. Light and its movement is a very important aspect of a mosaic. In fact, one of the most essential components of a mosaic." In 2012, Candussio played a crucial role in the realization of a new pavement for the Piazza Candiani in Mestre near Venice. "In Mestre I did the project together with my son Antonio who is an architect. The actual mosaic artwork was designed by another mosaic worker but, because of the size, 1700m2, and the logistical and technical complexity of the work, I was asked to develop a computerized system so that it could be realized. Originally, they wanted to lay the floor in the great square in 7 months but that was naturally not feasible because you cannot close such an important public place for so long. There are all kinds of cinemas, art galleries, major shops, a large bookstore and lots of people and traffic. For the mosaic we used both ultra-modern technologies and traditional materials. We did it in stages, each day closing off a different area. Eventually, we managed to complete the project in six weeks and there were some 20 people working on it each day. Because of the large surface and the logistical challenge, the project really is one of a kind. The paving stones are 3 cm thick so that they can withstand heavy traffic and other heavy loads."